Inside: Honey, that sticky sweet liquid made by busy bees is chock full of vitamins, minerals, and pure goodness. It’s used to fight certain diseases, suppress a cough, heal a wound, bury the dead and more. 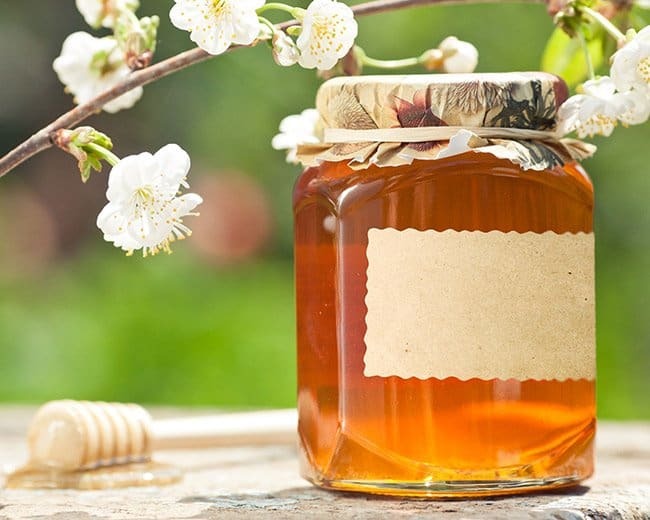 With over 300 varieties available, here are 22 interesting facts about honey. Did you know that honey is considered a very healthy food? The reason is simple…honey is loaded with vitamins, minerals, enzymes (which are important for digestion), antioxidants, flavonoids and more. Flavonoids are phytochemicals and give fruits and vegetables their beautiful colors. They also protect the plants against disease and when we eat those foods, our bodies reap the benefits from these nutrients. Antioxidants protect us against free radicals in our bodies. Honey has been around for thousands of years. In fact, it’s as old as the honeybee! 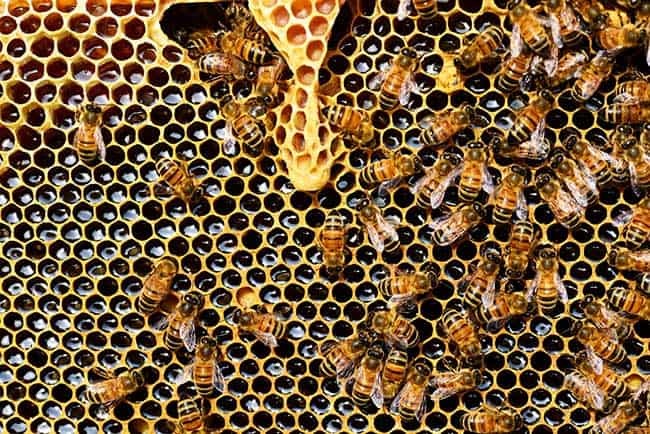 Beekeeping has been practiced since 700 B.C. 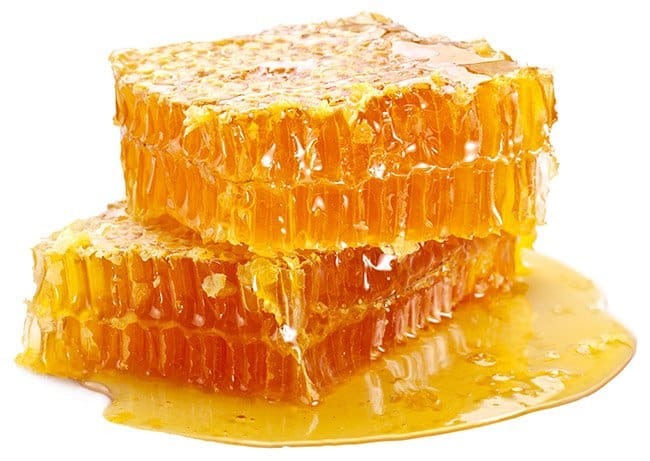 Many early civilizations used honey for medicinal purposes and slathered the sticky stuff on their wounds to help speed up the healing process. Supposedly the body of Alexander the Great was embalmed with honey and because this “liquid gold” was fairly scarce, only the wealthy had access to it. But, a fascinating aspect of honey is how it’s produced…thank you, honey bees! A beehive usually consists of between 20,000-60,000 bees. These busy-bee workers pollinate, gather nectar, and return to the hive where they regurgitate the nectar into another bee’s mouth. This process is repeated until the nectar is put into a honeycomb. At this point, the nectar is mostly a liquid so the bees use their wings to “fan” the honey, which causes the water to evaporate. Eventually, the bees seal the honeycomb with a liquid from its’ stomach and it hardens into beeswax. Now, the bee has something to eat for the winter months! This is just half the story. Bees literally travel all over to gather nectar from flowers. In fact, they travel the equivalent of two times around the world for this sweet substance. And they do it in their short lifespan of a few weeks to four months. At the end of its life, the bee’s contribution to the hive is one-twelfth of a teaspoon of honey! But every bit that every bee gives is important because collectively the bees produce about 60 pounds of honey in a year. Bees are an amazing example of the power of team players. Each contribution is necessary and needed to sustain the hive throughout the year. The next time you purchase a bottle of honey, take a good look at this liquid gold and reflect on the sacrifice of the thousands of bees that went into making this for you. First, do NOT give honey to children one year of age or younger. Why? Because honey can have a bacteria called Clostridium botulism which can cause infant botulism. And, it can be fatal. Second, before giving honey to your child, check for a pollen allergy. Raw honey usually contains traces of pollen and may cause issues with your child’s digestive system. It doesn’t happen often, but there is still a possibility. Since ancient times, honey has helped heal wounds. 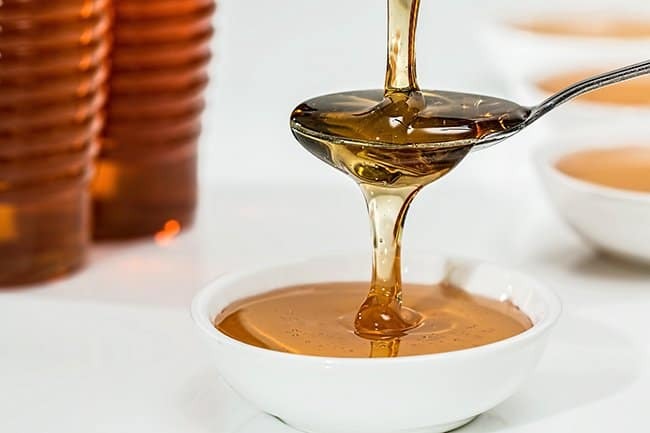 Two reasons: honey has an anti-inflammatory action which brings down the swelling of the wound and it has antimicrobial activity that kills germs and clears the infection. Today, honey producers in New Zealand and Australia have honey tested in laboratories to gather samples with the highest germ-killing activity. These kinds of honey are labeled ‘antiseptic” and sold to customers. Raw honey helps prevent tooth decay because it lowers the amount of acid in the mouth responsible for tooth decay. When your child gets a runny nose or a bad cough…what do you do? Run to the medicine cabinet? Give the mixture to your child 2x/day until the symptoms have vanished. Give one of the doses at night for a restful night’s sleep. Your child will like the taste…it’s very sweet and soothing. Why does it work? Again, honey kills viruses (antiviral), kills bacteria (antibacterial) and is high in antioxidants that help fight infection. We all know how a soda or cup of coffee perks us up and gives us energy. However, there’s a healthier solution for energy…honey. Kids also need sustained focused energy, so try this with them, too. (especially when they’ve been playing too many video games). Essential minerals, calcium, and magnesium in a natural, bio-available form. Everyone wants to stay well, which means having a strong immune system that fights off disease, colds, flu and a host of other health issues. Coconut Oil helps to boost the immune system, but giving honey to kids may be an easier alternative. Honey helps to stimulate the production of immune cells in the body and with more and stronger immune cells, it’s easier to stay healthy. Raw honey also contains an immune-boosting, probiotic bacteria to keep us healthy. For an extra punch of immune-building activity add ginger and lemon to your honey tea. This is honey that comes right from the beehive. It is unheated, unpasteurized and unprocessed so that all the vitamins, minerals and enzymes are intact (enzymes are important for digestion). It tends to be thicker, cloudier, and is brimming with healthy goodness! For many years I purchased raw, unprocessed honey from a beekeeper (until he retired). Our family loved it; we ate it out of the jar and I baked with it; substituting sugar with honey. There are many types of honey: raw (unheated), pasteurized (heated to 150+ degrees). If you want honey with all the vitamins and minerals intact, opt for raw honey. It’s thick and delicious! This is honey that has been heated to at least 150 degrees Fahrenheit. It is thinner in consistency and pretty much 100% of the nutrients are destroyed in the heating process. Microscopic particles and the pollen so important to the nutrient-dense honey are destroyed leaving behind a thin, watery substance. This is most of the honey found in grocery stores and 76% of it is considered “fake,” because it’s not pure honey and other substances (like high fructose corn syrup) have been added. This kind of honey has a lot of gray areas. First, honey can be certified organic by the US government, but they have no regulations to define organic honey. And, they do not inspect for organic honey. how they are treated for parasites, etc. If you are at all worried about the risk of botulism, pollen issues, pesticide or other chemicals, stick with certified organic honey. My suggestion: if you have access to a beekeeper that you love and trust, I would purchase my honey from him/her. Believe it or not, there are over 300 types of honey and each type is good for a different ailment. What determines the taste, the look and even the smell of a honey depends on the nectar source of the honeybee. There are over 300 varieties of honey found in the world. And every honey helps and protects the body from disease, etc. Add different types of honey to your diet for the best healthy result! Clover honey is the kind I ate as a child and is my favorite. Love the mild taste, texture, and smell! There is more clover honey in the United States than any other. Is made primarily in New Zealand and is good for the stomach and intestines and protects against the formation of gastric ulcers, 12-duodenal ulcers, and gastric cancer. This honey is from California avocado blossoms. It is loaded with vitamins and minerals and can be used to slather on burns. This dark honey is produced in the Eastern United States and is filled with antioxidants. Plus, it has more antibiotic characteristics that even Manuka honey! It’s loaded with lots of vitamins and minerals (all bioavailable because it’s a natural source) and important enzymes to help aid in digestion. Like the eucalyptus plant, there are many different varieties of this honey from California. Helps with respiratory, sinus, and bladder infections. Because of the benefits of honey, try incorporating it into your family’s diet–on your oatmeal, your toast, or substitute honey when cooking. Have your family try different kinds of honey and eat at least 1 tablespoon a day for better health. Do you have a favorite recipe that you use with honey? Does your family have a favorite way they enjoy eating honey? What is your favorite kind of honey? Please comment in the section below. Want to remember this post? 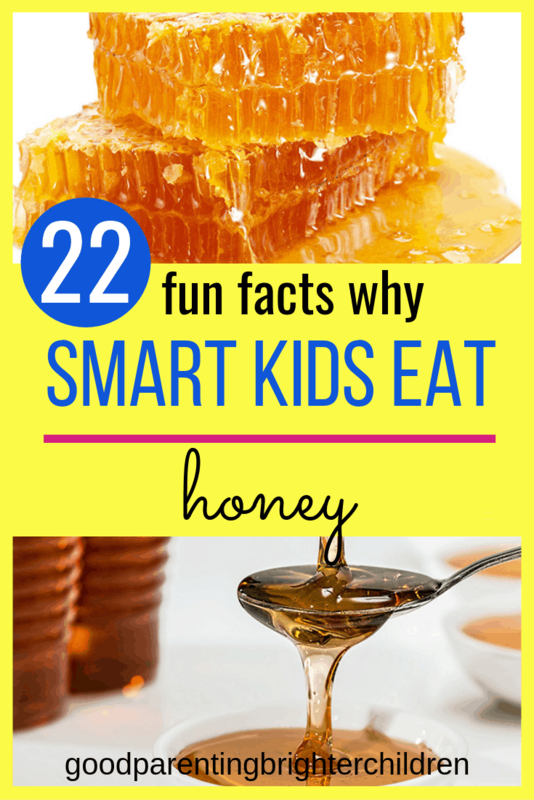 Post, “Honey: 22 Fun & Fascinating Facts That Will Make You Smile” to your favorite Pinterest Board! « 9 Unique Ways to be Amazingly Smart! Your “HONEY” topic is very timely. My adult daughter has been quite ill for a few years, and, although she is able to work outside the home, her allergies have caused several emergency trips to the hospital, where she spends hours in either an operational procedure, or hooked up to a blood cleaning apparatus so that she can breathe and stay alive. That said, she is the person who told me about Manuka Honey. We buy and store it because it seems to have the curative powers that counteract her extreme sensitivity (allergy) to several adverse-producing plants in our area. Thank you for sharing the story of Honey. Your topics each week are valuable to parents of any age! Wow! A great testimonial for Manuka honey! I forgot to say in the blog–Costco is selling a large container of Manuka honey for $30.00–and most that I’ve priced are $78 to $100 for the same size jar. How much does she take each day? I take 1 tablespoon–but I have family members (with allergies) that take more. What’s interesting is that supposedly buckwheat honey is supposed to be even stronger than Manuka–have you heard that? Thanks so much for sharing! Sharlene, some pharmacists carry Medi-Honey. It comes in a tube. Years ago when I was going to the Wound Care Clinic, they used it on my toe that had sores that would not heal. It really made a difference! I was shocked at first, that I was in a hospital where they had access to all kinds of healing salves, but they chose to use honey. But I soon became a believer! Oh my gosh, Mary–this is an amazing story! It’s amazing because the medical community actually recognized something powerful for healing that is found in nature! I’m glad you told me about the honey-in-a-tube. I’ve read a lot of reports about antiseptic honey and how its produced but just never took the time to actually purchase some. Was it available over the counter? or did you have to have a prescription for it? 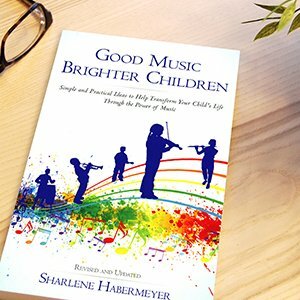 Thanks for sharing–fabulous story!